Lauren Beth Culpepper, Female, born __ 1985 in Harris Co., Texas, child of Thomas Alan Culpepper and Rhonda Bradshaw. Taylor Travis Culpepper, Male, born __ 1992 in Harris Co., Texas, child of Thomas Alan Culpepper and Rhonda Bradshaw. Max Warren Culpepper, Male, born __ 1983 in Dallas Co., Texas, child of Michael Gene Culpepper and Pamela Denine Landua. Michael G Culpepper, 38, married Vicki L Blodgett, 26, on 13 Jun 1997 in Collin Co., TX. Education University of Arkansas, J.D., Texas A & M University, B.B.A. Source: http://www.martindale.com (retrieved 31 Jan 2010). E-mail written 1998-2000 to Lew Griffin from Frank Sanders Ziegele, (deceased 9 Jan 2001). John Hallford Hidle, compiler, Tracking Your Roots: Tombstone Inscriptions of Covington Co., Alabama, Montgomery, AL: JH Hidle, 1995, Repository: LDS Family History Library - Salt Lake City, Call No. US/CAN Book 976.127 V38h. + Clyde Culpepper Hart, 5 Jan 1890 - 14 Mar 1930. Willene J. Whatley, Conecuh County Marriages. Evergreen, AL: Southern Business Forms, 1990. FHL US/CAN Book 976.1263 V2w: "Clide Culpepper married Cleveland C. Hart on 13 Oct 1912 in Conecuh Co., AL." E. C. Culpepper and Miss Becky J. Herndon on 17 Nov 1878 in Laurens Co., GA, Bk I-297. Rebecca Culpepper, Wife, F, 66, md, GA/GA/GA. John Culpepper, 27 Nov 1920 at age 38, Harlan Co., KY, 20, 27127. E-mail written Jun 2005 to Warren Culpepper from Scott Daniel, e-mail address. From delayed birth certificate (issued 1960) for her daughter, Nellie Culpepper. Both the 1910 and 1930 censuses said his middle initial was J, not G.
J. G. Culpepper and Mamie Alligood on 22 Dec 1907 in Laurens Co., GA, Bk N-112. James E. Culpepper, 28 Sep 1921 - 3 Sep 1923. "Nellie" from delayed birth certificate (issued 1960). "Handwritten notes from my grandmother say Minnie Culpepper died as Nellie C. Brinker on March 9th 1967 at the age of 79. It also says she was born March 6th but gives no year. The math says the date of birth should be 1888. (her delayed birth certificate says 1889) It shows her as buried in Forest lawn Memorial Gardens in Thunder Bolt Ga, Lot #80 A Sec 5. It later says her daughter Nelle Thompson died Oct 9th 1975 and is buried in the same cemetery." From delayed birth certificate (issued 1960). 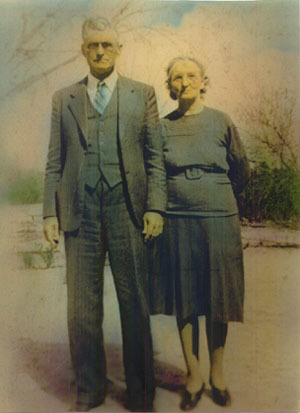 Minnie Culpepper and Eudie S. Abernathy on 13 Sep 1908 in Laurens Co., GA, Bk N-139. "Eudie Abernathy died April 21st 1936 and is buried in Tifton Memorial Garden, Tifton, Ga Lot 9, Block #149. This comes from a hand written note from my deceased grandmother. It says his date of birth was Jan 1 without giving the year. Since later it states he died at age 56 in 1936, I'm going to assume the year was 1880."